To ensure that you play with good rhythm it’s a great idea to practice guitar with a metronome. You can use a metronome for a separate rhythm practice or, an even better idea, use it for anything that you are practicing on the guitar when you are practicing by yourself. O.k. so let’s just start with some exercises you can do with a metronome, simply to practice rhythm. Staying in 4:4 time (quarter notes), now try strumming up strokes and down strokes. This time we are going to bring in chord changes. The same as exercise 3 (i.e. incorporating chord changes) but this time bringing in up-strokes as per exercise 2. Repeat exercises 1-4 above but this time reduce the speed to 70-80BPM. Even though it’s somewhat counter-intuitive, it will actually be more tricky keeping in time at a slower tempo like this. That‘s not to say that playing faster is easier. It’s typically easier, with a simple strumming pattern, to be playing at a moderate speed – around that 120BPM mark. Playing slower or faster is more difficult. So for exercise 6 increase the speed to 140BPM and repeat exercises 1-4. If you find that 140BPM is still really comfortable then challenge yourself a bit by increasing the time again to something higher. However, don’t increase your speed if you are making errors. If you are making errors, then reduce your speed until you are at a comfortable speed and not making errors and then slowly increase the speed again. Try playing a simple finger-picking pattern or flat-picking pattern along to the metronome. Note: You want to slowly make it more challenging. If you increase or decrease the speed too much and you are making a lot of errors it is not good practice. If you are making the occasional error, that is fine – just keep practicing until you can play at that speed error free. But if you are making a lot of errors, then you are playing at a speed that is either too fast or too slow for you and you should change back to a more comfortable speed. By gradually increasing and decreasing the speed, you can move from one stepping stone and master it before moving onto the next. Once you feel like you are nailing all of the above exercises, at a variety of speeds, and you want to challenge yourself further, then you can also try changing up the time signature. Experiment playing in 3:4, 6:8 etc to learn different time signatures. Most modern music is in 4:4 and that is the most comfortable for people because that’s what they are used to hearing. So get out of that comfort zone and learn some new time signatures. It will help to expand your playing – and even if you aren’t going to being playing music like Jazz, Classical etc, that use other time signatures more often than popular music, there is some music in popular music in different time signatures. Plus it will just make you a more well-rounded guitarist overall and will add to your compositions, if you write songs or want to write songs. Whilst it’s a good idea to do some rhythm practice, like in the exercises above, it’s also a good idea to use a metronome in your normal practice. 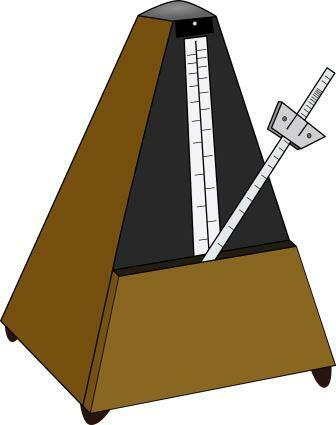 If you are learning a new piece of music, you may not start out using a metronome – but as you become more familiar with the notes of the song/composition, then it’s beneficial to then start to practice that song with a metronome. In fact using a metronome as you learn can even make a song easier to learn. Set the metronome at a relatively slow pace to begin with. Play along with the metronome, keeping in rhythm. The reason this can make the song easier to learn is that it forces you to play the song at a slower pace. Once you are playing error free at a slow pace, increase the pace slightly. Once you are playing error free at the new pace, increase it again slightly. Keep going until you are playing error free at the original pace of the song. If you practice with a metronome your timing will improve with leaps and bounds. This will not only make you a better guitarist, it will make your playing more pleasant for those listening to you play. And, importantly, it will help you to play in time with other musicians, whether in a duo, a band, an orchestra or any situation where you need to play in time with others. Thanks for reading and I hope this post will help with your rhythm.